We have a new addition to our website team for this year’s Festival. Rachel Wallace who writes about green issues (including a chapter in the excellent Fair Trade Revolution book) will be reporting on green, ethical, local, organic and Fairtrade initiatives at the Festival. As I gaze across the camping grounds on this beautiful sunny final evening, I hope that tomorrow we all go with the Festival’s Love the Farm, Leave No Trace campaign and that the cows are soon back to grazing here. 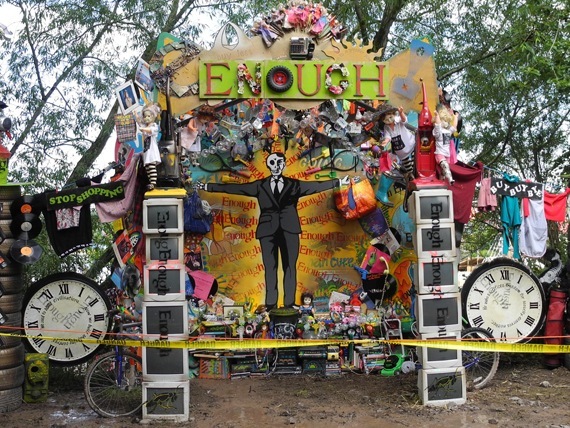 Despite Glastonbury now having an onsite recycling centre and decorative recycle bins all over the place, it still frightens me just how much we are consuming. If I think there seems a lot of waste from 175,000 people here, what must 60 million of us in the UK be consuming and chucking into our wheelie bins each week? It’s terrifying. The inequality and wrongness of it all is emphasised by chatting to the Oxfam campaigners who are raising awareness for their new campaign GROW. 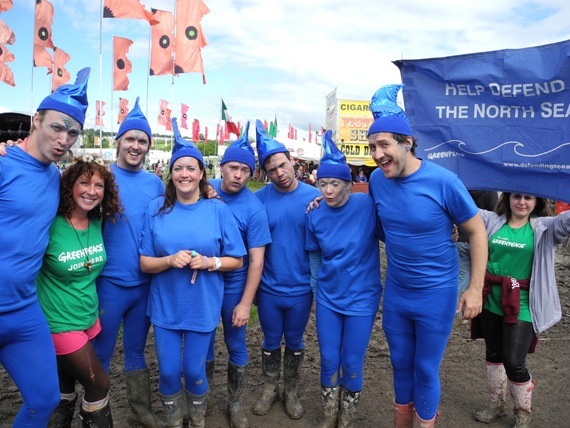 As well as providing 2,000 cheerful volunteer stewards for Glastonbury, Oxfam also has 55 campaigners, out and about in the crowds this year with buckets of green paint and giant hands. 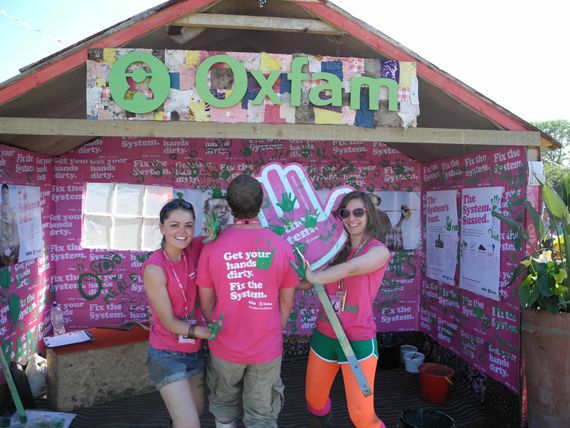 Festival-goers are splattering the Oxfam hands, stalls and themselves green, as campaigners talk to them and encourage them to ‘Get your hands dirty. Fix the System’. This is the global food system, where 1 in 7 people is hungry because the global food economy ‘system is bust’ due to soaring food prices, lack of access to land, and inequality. Do check out their website for more info and details of how to get involved (www.oxfam.org.uk/hands). It’s quite a message in a long weekend where our options for enjoying ourselves far outweigh the time available. If we genuinely care about creating a better world when we’re in a field listening to our favourite bands, we’ve got to carry it on with action as activists and better consumers when we leave. Which leads me on to my visit to one of this year’s Green Trader award winners. 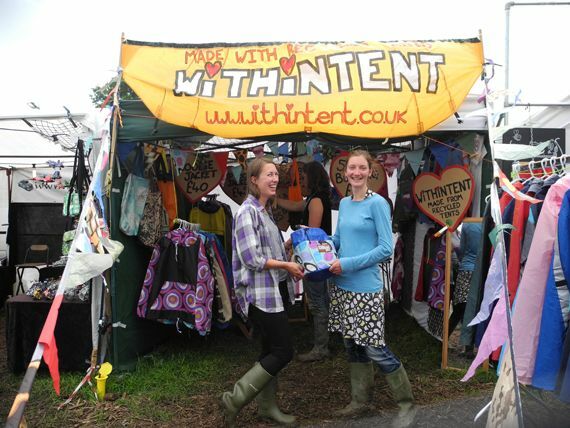 I popped in to see WITHiNTENT (www.withintent.co.uk) and had such a fun hour chatting to founder Kate and sharing her pear cider. She’s refreshingly down-to-earth and low key about her fabulous work. 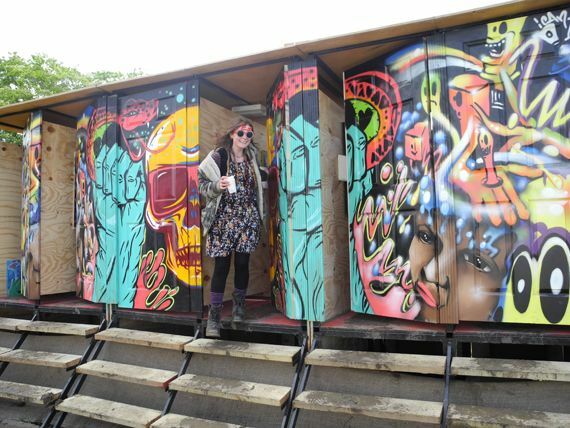 Leaving Glastonbury in 2009 and seeing so many abandoned tents, she decided to turn part of the problem into an up-cycled solution by gathering up the tents and making them into funky bags, raincoats and ponchos. She works from her home in Hackney and dries out the mass of tents on her washing line, which intrigued her neighbours until she got to know them. Kate pays a fair wage to an empowered and outspoken Muslim women’s needle association on Brick Lane to sow them up. 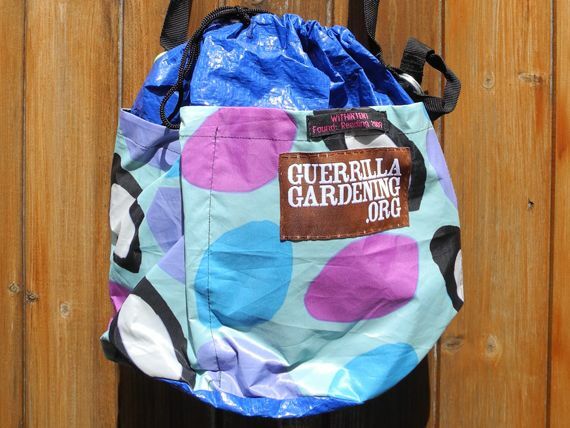 I bought a beautiful bag from her and love that it champions guerrillagardening.org – an organisation organising community groups to take over disused land in cities for community veg and gardening projects. 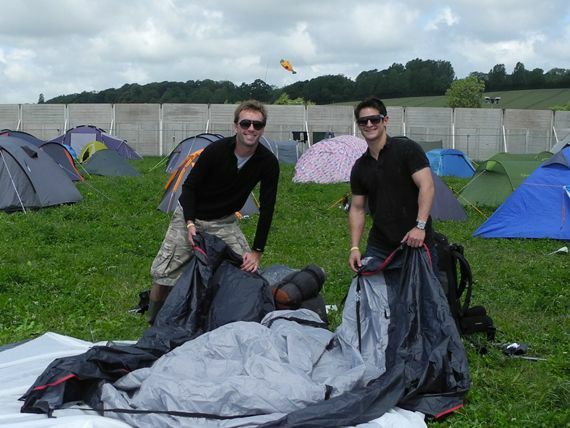 Kate stresses that abandoned camping gear at festivals is still a huge problem and her company by no means can make use of them all. 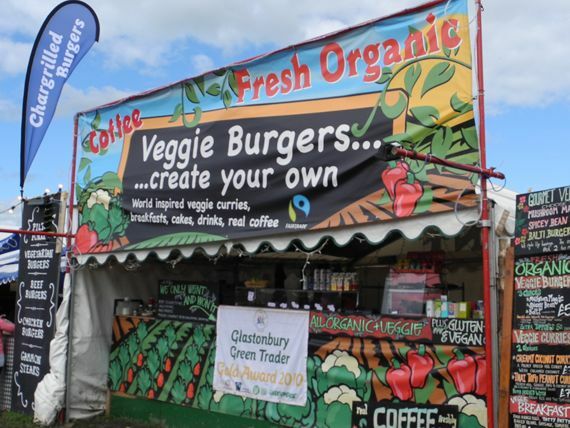 There are eight Green Trader awards given out each year at Glastonbury (details of all this year’s winners will soon be on the website). The judges are looking amongst the 400-odd stalls for the ones that most champion organic, Fairtrade and local ingredients, have a low carbon footprint, are minimising their energy usage, and recycle and reuse wherever possible. Here’s one of last year’s scrumptious winners. 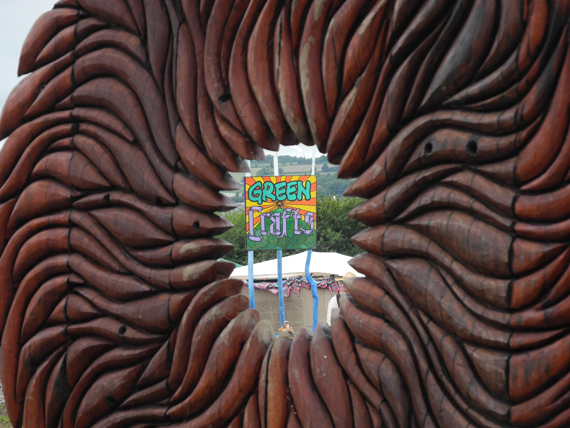 There are so many more ‘green’ things to tell you about at Glastonbury. I never did get around to the solar shower, I stuck with my bucket, there were just so many things to do. I didn’t make it for a self-help massage in the Healing Fields although I did appreciate the beauty and tranquility of the area wandering through. 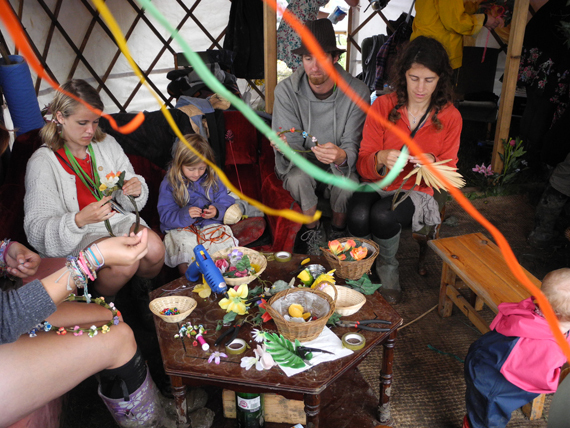 I didn’t listen to the activist debates in the Leftfield, or browse the Free University of Glastonbury in the Park. We’ll just have to come back for more in 2013! Thanks so much for joining me this time. Day dreaming whilst winding flowers and ribbon onto a willow head garland for Winnie this morning at Ring A Ring O’ Roses, I realised that the Green Craft Field was just what I needed for a bit of fun and therapeutic time out. The possibilities here are endless and exciting. 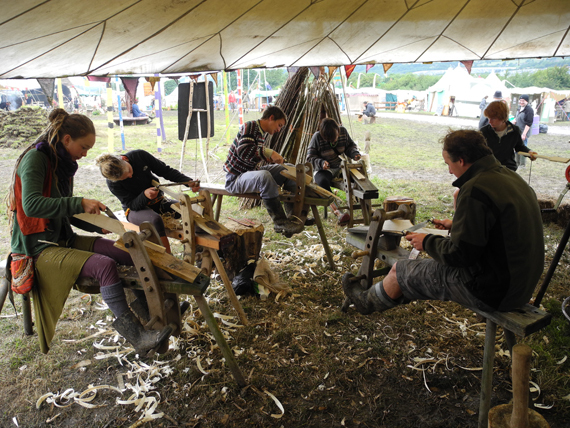 You can have a go at basket weaving, stone carving, making your own enormous wooden spatula or watch a Shamanic drum under construction. It’s definitely worth a visit and I noted that the adults were having at least as much fun as the kids. There’s a happy hour every morning from 10 til 11 when lots of activities are free, although it’ll feel like a small amount of money well spent at any time of the day to support the lovely craftspeople in the village. My favourite lyric of the day came from Cargo Fleet, ‘Simon Cowell is a towel and he’s drying me out’. 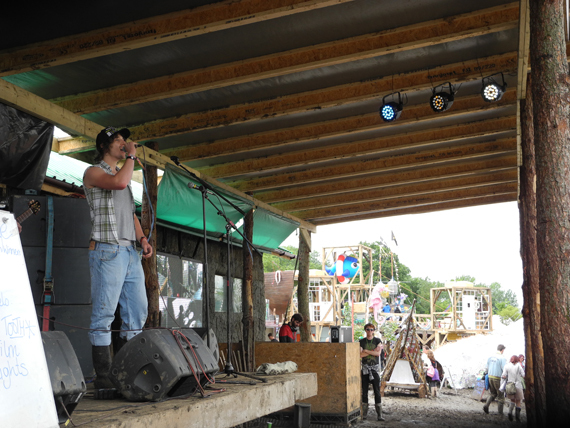 The band were performing in a new bands competition run by Cowshed (www.cowshedstudio.com) to record in their studio made from strawbales in the Greenpeace Field. Cowshed are running the stage this year, encouraging a new wave of protest songs, and working with artists to record an album to raise money for Greenpeace’s new Rainbow Warrior III campaign ship. I was thrilled to find British heritage seeds to grow in our organic veg patch at the Garden Organic (www.gardenorganic.co.uk) stall in the Greenpeace field. We’ll soon be having a go at growing purple flowered Russian peas, Mrs Cannell’s Black runner beans and Portuguese Cabbages. We picked up a form to join the Heritage Seed Library which is striving to save Northern Europe’s traditional vegetable varieties as they’re fast disappearing, giving out seeds for you to grow each season and getting you in on a national seed swap. How exciting! We went on to chat to the lovely ladies at the Soil Association stand about Community Supported Agriculture (lots of info available under community section of their website www.soilassociation.org) and the schools programme (www.foodforlife.org.uk), both of which we want to be a part of as we expand our veg patch in this direction in the coming years. The stand included an eye-catching washing line of paper pigs, written on by Festival goers, responding to the question, ‘What is your idea of piggy heaven?’ Not, presumably, the latest mass production pig farm to apply for planning permission in Derbyshire, coincidentally a few miles down the road from my parent’s farm. 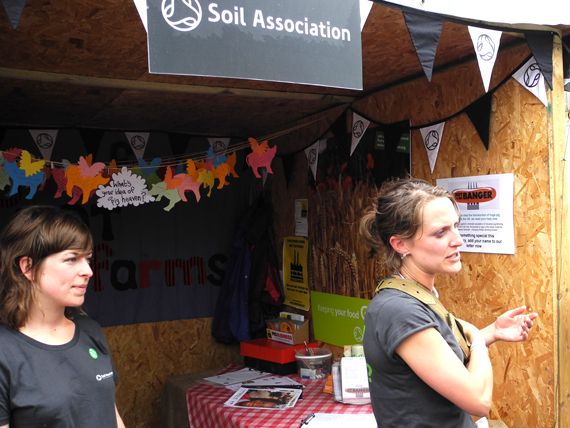 The Soil Association is petitioning to stop it going ahead. I believe in petitioning but I also feel strongly that in the UK we increasingly vote with our shopping baskets. If we keep buying cheap meat, smaller family farms in the UK go out of business and we end up with factory-style production units and imports. How depressing and avoidable. Right, I’m off to listen to some bands! I can’t believe it’s the last day tomorrow and there’s still so many great things to blog about. Since spending time living in rural Nicaragua with no running water, but where everyone starts the day immaculately clean with a bucket and bowl wash, I’ve upped my festival standards on the cleanliness front. After a brilliant but sweaty late night out dancing, I woke up feeling in need of an immediate refresh so opted for the bucket and bikini outside the tent. I’ll be trying out the solar showers in the Greenpeace Field over the weekend. 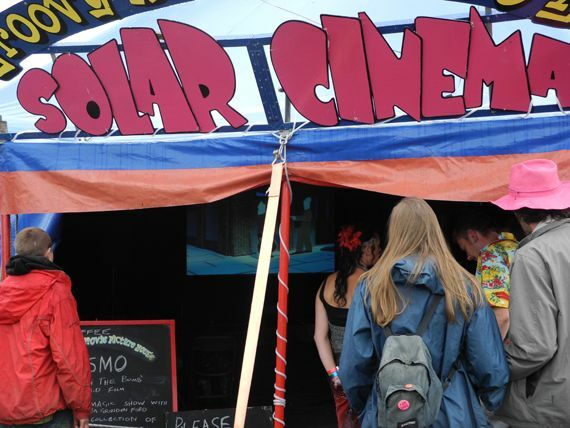 We did, however, pop in to check out the animated film in the solar-powered Groovy Movie Picture House at the entrance to the Green Fields. It’s a great place for a bit of downtime watching independent animations and political films. I love hearing the great variety of music drifting across from so many different stages, tents and the odd wooden bandstand as we meander around the site. 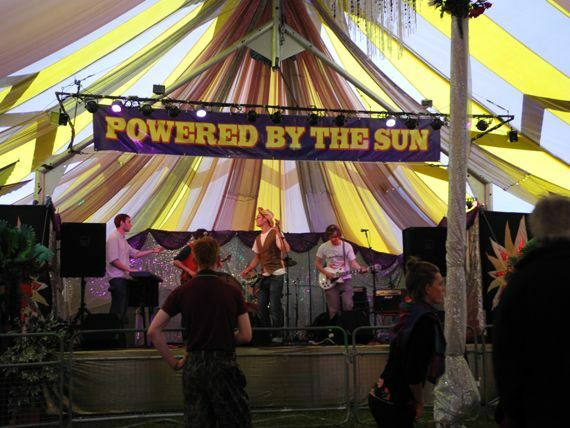 It’s pretty unique to be able to dip into somewhere to listen to a couple of songs, like this band in the solar-powered Croissant Neuf tent, and then twenty paces later, be in a totally different experience. 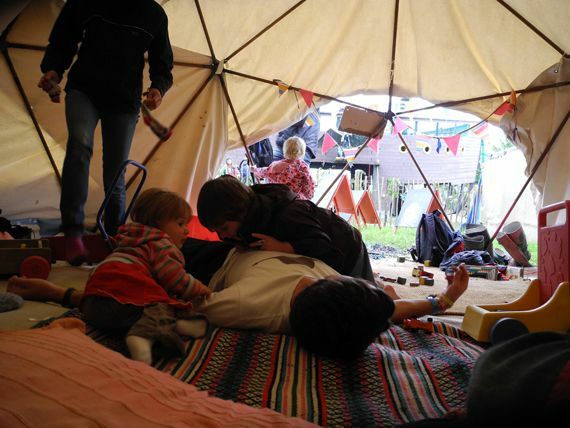 After listening to Jenny and Johnny on the Park stage and admiring the fence décor of the local primary schools eco-artwork, we spent a relaxing late afternoon chilling out in the Green Kids toddler tipi tent with friends. Wandering back through the Greenpeace Field, I bumped into an old friend Veronica on the Fairtrade Foundation (www.fairtrade.org.uk) stand, where my daughter Winnie enjoyed chomping her way through yummy Fairtrade dried apricots from Tropical Wholefoods (www.tropicalwholefoods.com) and I got stuck in to the chocolatey deliciousness of Divine’s special Glastonbury festival bar (www.divinechocolate.com). Along with Cafedirect (www.cafedirect.co.uk) and nut company Liberation (www.chooseliberation.com), Divine takes empowerment through Fairtrade a significant step further as the farmers who supply the cocoa from Kuapa Kokoo in Ghana are part-owners of the company and sit on the board. I rounded off the samplings from some of my favourite Fairtrade companies with a smooth, full-bodied organic double espresso supplied by worker’s cooperative Equal Exchange (www.equalexchange.co.uk) served up skilfully by the team at the lovely Cafe Tango. 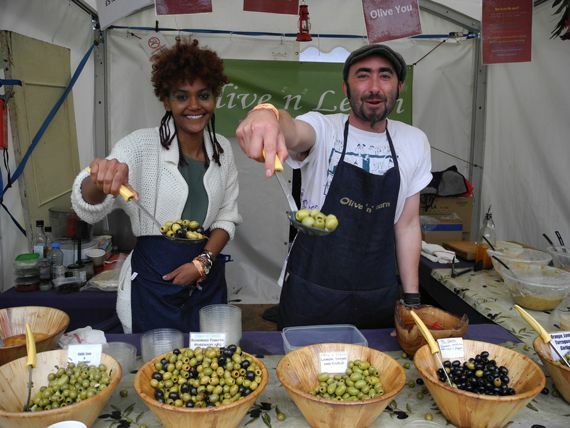 Winnie’s yet to try an olive, and there is no better place for an induction than with the infectiously enthusiastic, head-over-heels in love with each other, their olives and vegetable growing, Cina and Christian, on the Olive ‘n’ Learn stand in the farmers market. They seem to be taking their name seriously, experimenting with all different varieties of home-grown garlic, chillies and herbs to complement the juicy, plump olives, grown by their friends in Catalonia. Winnie pulled a few hilarious faces as she tentatively licked it before nibbling one all the way back to our tent to get ready for an evening of Caribou and salsa dancing. Tomorrow I’ll be checking out the free happy hour in the Green Craft village and seeing who’s won this year’s Green Trader awards. Ambling across the vast field in front of the Pyramid Stage this morning, which tomorrow will be full of happy revellers, we came across a giant poo. 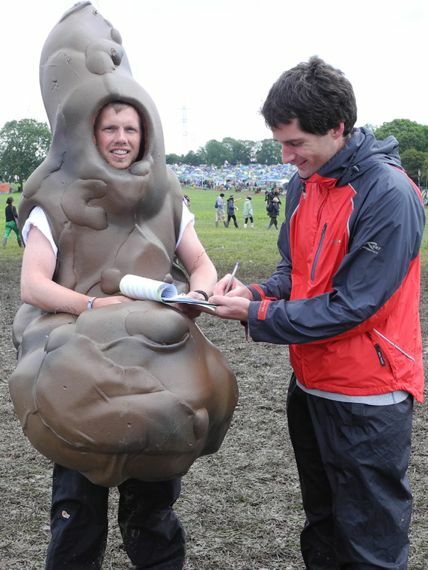 Or rather, the very cheerful (considering his situation) Nick Ashby of WaterAid dressed as a poo. He is showing an admirable commitment to a very important cause – WaterAid’s LooQueue campaign (www.wateraid.org/other/looqueue) at Glastonbury, which aims to sign up at least 30,000 festival-goers to petition the UK government to commit to help the two thirds of the World’s population out of the sanitation crisis in which they live. An unimaginable 2.6 billion people live without access to clean toilets, a major cause of ill health and death. What makes a good clean toilet? Our way, flushing gallons of water down the loo every day, seems neither very sustainable or logistically possible for most people who are lacking a loo. My friend Emma Sinclair, has become something of a poo expert since joining children’s charity Plan International (www.plan-uk.org) and living and working in West Africa. Having attended many a poo workshop, I learn from her that a crucial aspect in building adequate sanitation in communities is ensuring everyone takes ownership and responsibility for it. If people have always pooed wherever they want in the nearby trees, then they are unlikely to use a latrine if it just suddenly arrives because they won’t realise the need for it. Education, then, plays a big part, e.g. showing how a fly lands on a poo, then moves on to land on their food. Communities are encouraged to construct their own latrines using local materials, the most important thing is that they have a washable slab and that they’re covered. The approach is called Community Led Total Sanitation (www.communityledtotalsanitation.org). How much poo we all produce becomes much more apparent and distressing to me when there are 175,000 of us using portaloos and drop toilets. I don’t normally consider what happens to poo, I just flush a load of water down with it, feel bad about that but relieved that it’s gone and move on. 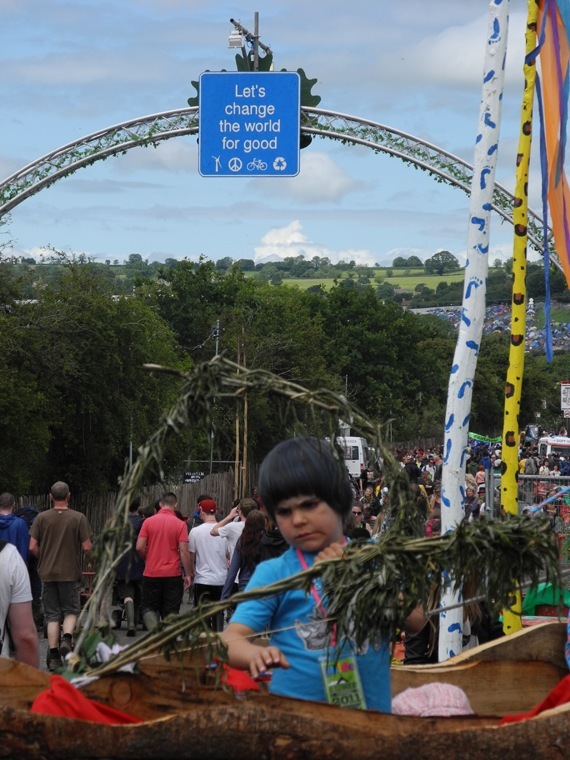 I want to look for a more interesting eco solution here at Glastonbury so I head up to the Green Traveller Cyclist camping field. I want to find a waterless, odourless toilet and I hear that composting toilets are just the thing. Indeed, as I approach, there are no mal-odours, just beautifully painted, impeccably clean drop toilets. Their proud owner, Squeak, of the cheekily named PooNarnia (it has a more staid web address eventloo.co.uk), tells me that through creating such a pleasant toilet experience, people always leave them clean, treat them with respect and that ‘everyone comes out smiling’. They are required to use a cup of sawdust after they’ve been to the loo and that’s all there is to it. The toilets don’t have to be sucked out and transported off, instead, they are filtered to drain the liquid from the sawdust concoction before it’s taken to a composting treatment facility. They’re definitely worth a visit if you’re in the area. Right, enough on poo. People seemed very happy with their lot all round in this camping ground and rightly so, with its solar powered showers and sunny aspect. Nathan and Luke had just arrived from London and were looking very perky. "Don’t most people arrive here by public transport?" they ask me. "It was so easy, we left London at 9am and were here by midday. Our journey was seamless." They made the right choice then. One came by festival bus and the other by festival train. I hope even more of us should do the same in 2013. 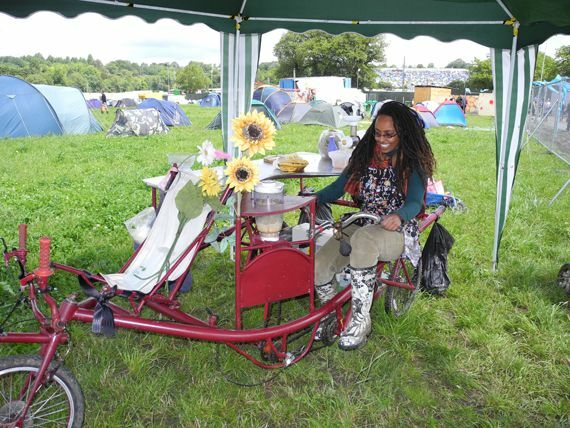 Before we go back down the hill for more exploring, we enjoy a zingy, refreshing carrot and ginger smoothie at the Rejuicynator, the camp’s pedal-powered smoothie bar. The solar-powered bike powers the blender and works up your thirst – it’s green and it’s drink satisfaction served up as a delicious refreshment in a biodegradable cup. If that weren’t enough, once you’ve finished your smoothie, you fill your cup with soil on their stand and plant a seed to take home and pot straight in the soil. 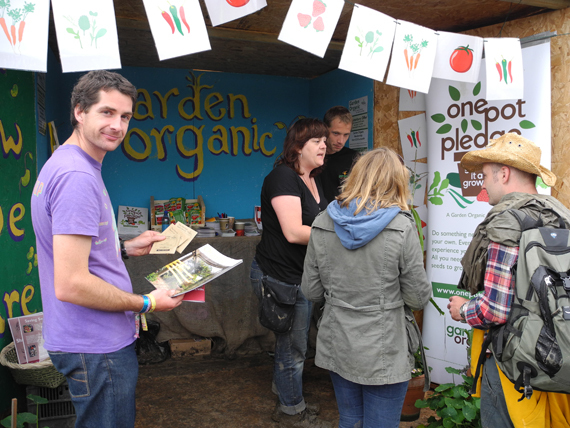 They’re a friendly and inspiring set-up, eager to spread the word on recycling, growing your own food, using alternative technologies and lots more. You can visit the Rejuicynator even if you’re not camping in the Cyclist Field, they also visit schools to spread the eco word (www.therejuicynator.org). I’ll be on to checking out the solar showers tomorrow, it’s time I had a good, sun-warmed eco-product wash ahead of some dancing at the solar-powered stages. It’s great wandering about the site before the music starts. 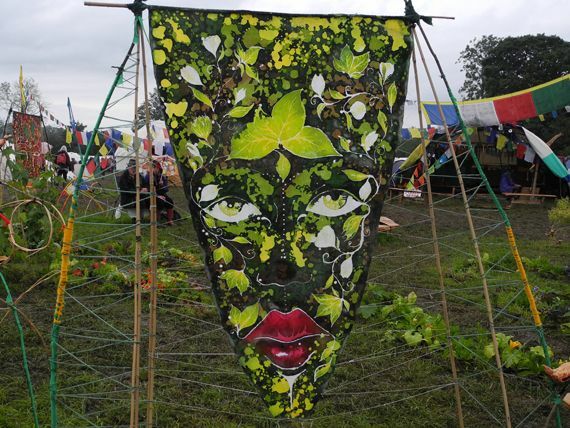 With no bands to dash and see, it’s the perfect chance to mooch around the Green Fields: admiring the beautiful recycled sculptures, chatting to inspired and fired up campaigners and meeting up with old friends. I was reminded just how impressive the scale, imagination and diversity of the festival is and how full of hope, positive messages and intentions its participants are. 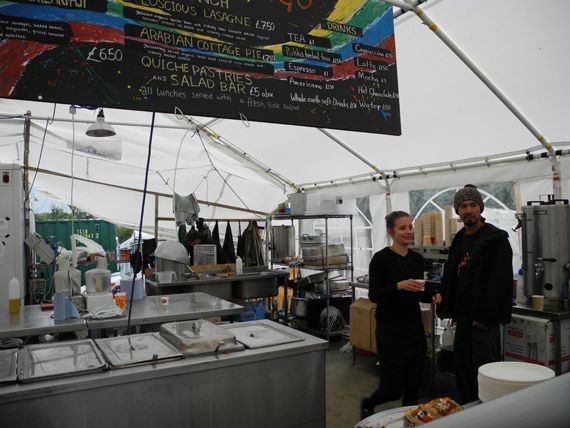 It’s overwhelming the number of stalls I want to visit in the Green Futures area. I’ll be there each day to discover more. I chat about Agro-Forestry in Africa and Latin America with the lovely enthusiast lady of Busy Trees. They are working with farmers to plant native trees as well as income generators, such as fruit trees and nut trees. The roots shore up the soil preventing erosion and they provide valuable shade to crops, as well as promoting biodiversity. My 11-month old daughter starts getting a little impatient so we wander on briefly before she is captivated by the sight of a living roof on a big, exciting looking den. 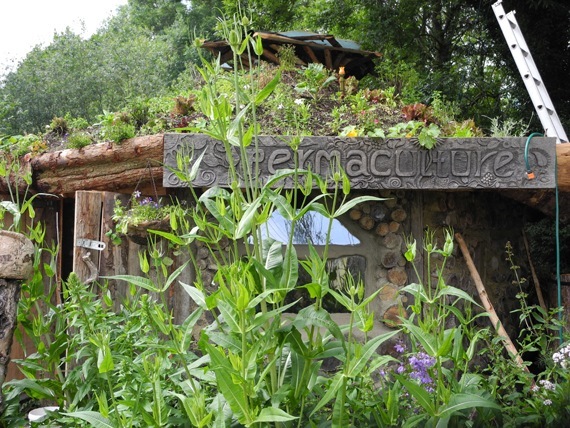 I love the simplicity of the Permaculture House, made from recycled materials, with a living roof and costing just £300, it blends into the wood and suddenly makes owning a lovely aspirational home seem very accessible if you are willing to work modestly with your surroundings. 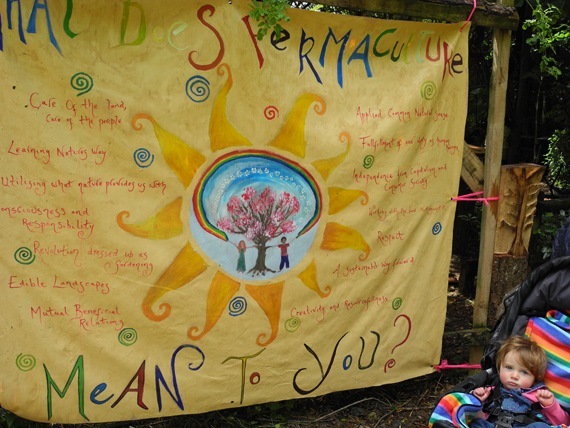 I love the ideas on the Permaculture poster – ‘Revolution Dressed up as Gardening’. How wonderful. I’m definitely in on this movement. Onwards then to traverse the festival by means of the railway track and we’re met by a suit-clad skeleton proclaming ‘Enough’ from an ecclectic display of consumerist junk that most of us usually pointlessly own. I love that I’m experiencing all of this with my wide-eyed daughter, it feels a lot better than pushing her around a shopping centre. We pass a swarm of Greenpeace tuna feeling full of festival fun whilst drawing attention to the plight of fish in the North Sea, before heading over to chat to affable dairy farmer Lloyd Green on his cheese stall Green’s of Glastonbury in the Greenpeace Farmer’s Market. I learn that around Glastonbury they had a better spring than the rest of the country and the grass grew well to store silage for the cows for winter, but the mainly damp, cold summer is causing them problems now and they’re having to dip in to winter feed for their dairy herd. My parents were dairy farmers and we discuss the difficulties of years of low prices driven by supermarkets. He is successfully adding value to his milk with his local cheese business and just had his first grandchild a week ago. Well done on both counts to Lloyd and his family. I enjoy a delicious juicy apple from the organic and Fairtrade fruit and veg stand Kinder’s Organics as we amble in the evening sunshine to our tent. It’s been a lovely first day. Arriving at Glastonbury Festival feels to me like entering into an alternative society for a few days full of fun, adventure, tolerance and solidarity. Losing myself in music, day dreaming staring at the passing clouds and fluttering flags, tromping around in my wellies, I stop thinking about work, houses, heating, cooking, baths and whatever else and enjoy a simplistic existence with my fellow festival lovers. It’s an equaliser but it also heightens my awareness of our heavy footprint on the Earth. I feel uncomfortable about the amount of water and petrol I get through and the rubbish we generate. 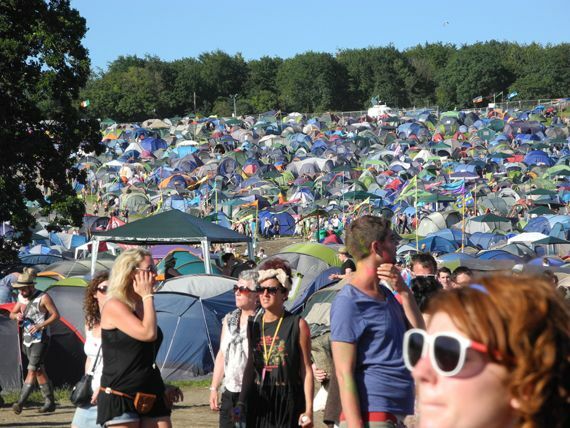 Glastonbury seems to highlight how we don’t really need most of the stuff we think we do. Friends, family, companionship, food, warmth and spirituality – be it through music, religion, whatever – is about what it boils down to for me, I realise, and maybe a hot pear cider as I’m lying in a field. Surveying it all from a vantage point up above The Park, it’s striking when there are 175,000 of us in a few fields just how much we consume and produce, even in our rustic state. We look like an insatiable, spoilt and very happy refugee camp. If this is a microcosm for my idealistic society, I want to be able to be as green, ethical, local, organic and Fairtrade as possible in it for a few days, learn some new stuff about it all and go away inspired and with renewed resolve to make some changes. I want it to seep under my skin as I live and love the Festival. 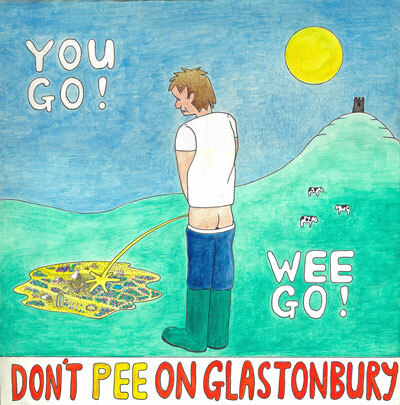 Glastonbury has some brilliant initiatives, including all the tea, coffee, hot chocolate and sugar being Fairtrade; championing local veg, meat and milk producers; recycling 50% of all the rubbish; only using recyclable and compostable crockery; solar-powering showers and stages; getting the water from its own purpose-built reservoirs; and rewarding you for arriving on your bike, a train or bus. I’m going to be finding out more about all this over the Festival and blogging back with photos, snapshots, insights and interviews. Please join me!